Make an estimate that you know is a little too high. Make one that is too low. Can you make one that is reasonable? ImageDo you need more information? ImageWhat is the most efficient strategy? Can you figure out the number of red/white/pink without counting? What patterns do you see? 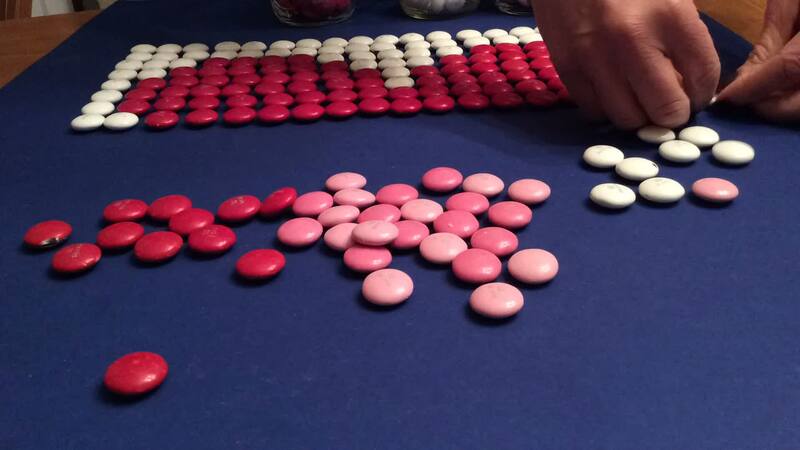 How many red, white and pink smarties? How many lollies in total? How many did he eat? how many of each color? How many candies does it take to make one full heart? How many of each color are there? how many pinks? how many reds? how many whites? how many candies were used? How many pink m & ms were used? What is the area of the heart? How many of each color are used? How many skittles of each color make the array? Where will we use the pink candies? some of the m&ms are cracked. why a heart? how many m n m's in all? How Many m and ms is that? How many of each colour? How many red M&Ms are needed to make the heart array? How can you figure out how many M&Ms were used? what is this gong to be? How many red candies were used? How long did it take to plan the heart design? How many candies are there in each color? How many m&ms are there? Are there more red or pink? How many m and m's of each color are used to make the array? How many objects were used to make this? What is the probability of selecting pink? How many candies is this? How many of each color were used? How much candy do I need? How many pink M&M's are there? How many m&ms are used? How many of each coloured smarty would you need to complete the heart? How many dark pink M7Ms are in the array? Join or sign in to leave a comment.